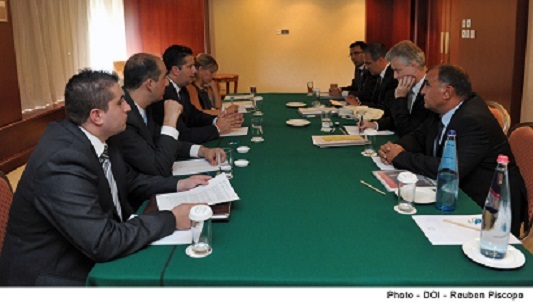 The MaltaIndependent wrote on September 6, 2013: "Robert Madelin, European Commission Director General, Directorate General for Communications Networks, Content and Technology discussed the positive action put in place by the new Government in the development of the new Digital Strategy for Malta. This fully complements the Digital Agenda for Europe (DAE) which aims to reboot Europe's economy and help Europe's citizens and businesses to get the most out of digital technologies. In effect in the EU, the digital economy is growing at seven times the rate of the rest of the economy. Full implementation of EU’s updated Digital Agenda would increase European GDP by 5%, or €1,500 per person, over the next eight years, by increasing investment in ICT, improving eSkills levels in the labour force, enabling public sector innovation, and reforming the framework conditions for the internet economy. In terms of jobs, up to one million digital jobs risk going unfilled by 2015 without pan-European action while 1.2 million jobs could be created through infrastructure construction. This would rise to 3.8 million new jobs throughout the economy in the long-term. Director General Robert Madelin discussed a number of issues with Parliamentary Secretary Hon Dr Edward Zammit Lewis including the sharing of ideas with regard to...read on."